In Part Two of our summer series on thinking games, we focus on those that exercise the brain’s visual-spatial abilities. The three games we recommend below will have you shifting, flipping, and rotating objects in your mind and sharpening your problem solving skills. There are variations on how to play, but in the standard solitaire approach, the object is to neatly place a subset of the pentaminos in a rectangular section of the board. If your goal is to tile N pentaminos (a “Penta N”), then the section will be an Nx5 rectangle. A player typically starts with a Penta 3 challenge. Once it is solved, the player adds another pentamino to the mix and rearranges the now-larger set of four pieces to solve the Penta 4. Next is a Penta 5, a Penta 6, and so on. The puzzles get progressively harder as you add pentaminos. Another neat way to play is to select one of the pentaminos and then use nine of the remaining 11 to create a larger version of the first one that you chose. This can be done for every pentamino. Challenge yourself to replicate all 12. There are 3-D challenges as well where a player uses the pentaminos and support pieces to build the three-dimensional objects pictured in the booklet. 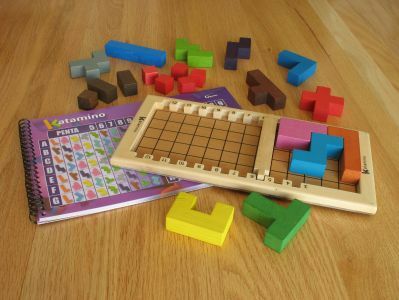 Mathematically speaking, the standard Katamino game is two-dimensional but played with three-dimensional pieces for practical purposes. We imagine that flat pentominoes that are hard to pick up would make the game incredibly frustrating to play, not to mention how fragile they would be in little hands. Katamino may also be played as a two-player game. In the speed game, players evenly divide 10 of the 12 pentaminos (all except for the “I” and the “X”) and all of the support pieces. The opponents then race to see who can tile his or her half of the board first. The strategy game uses only the 12 pentaminos and an 8×8 board included in the booklet. Each player takes a turn placing a pentamino anywhere on the board. The last player to place a pentamino on the board wins. Recommended Age: The manufacturer suggests ages 3 and up, and we couldn’t agree more. With its colorful wooden blocks, this is just the kind of game to captivate and stimulate young minds. Kids can’t help but be enticed by the colorful assortment of shapes that almost seem to call out, “Build something with me!” And with the eight smaller support pieces, even three-year olds can enjoy the challenge of tiling without any guidance. Multipurpose: Katamino is a great game with which to introduce concepts from Euclidean geometry. Don’t be afraid to use mathematically precise terms such as “polygon” when playing with a child who has not studied the subject. Start by assuming that the pieces are comprised of unit cubes and explain what that means. Then show how to compute the perimeter and area of each face as well as the volume of each shape. Flip and turn the shapes to demonstrate the concept of symmetry. Which pieces have reflective symmetry, and what are the lines of symmetry? Which pieces have rotational symmetry, and what is the order of the rotation? Another two-player variation is to play a game of balance by using the blocks to build a stack. Each player takes a turn placing one block on the stack. Whoever is last to place a piece on the increasingly unstable stack without causing it to topple is the winner. This is a great way to sneak in some basic principles of Newtonian physics. Easier Adaptation: Gigamic makes an easier version called Winomino that includes six of the 12 pentaminos and ten additional pieces that are formed by one, two, three, or four cubes. The smaller pieces allow greater flexibility in solving the Penta challenges. The prices for Winomino and Katamino are about the same. If your child is older or is a natural visual-spatial thinker, then we suggest bypassing Winomino and going straight to Katamino. Noteworthy: Pentominoes belong to a more generic class of shapes called polyominoes, so named to be consistent with the two-square shape of the well-known domino. Use four squares and you get a tetramino, which is the basis for the popular 80’s video game, Tetris. You can play Tetris online. 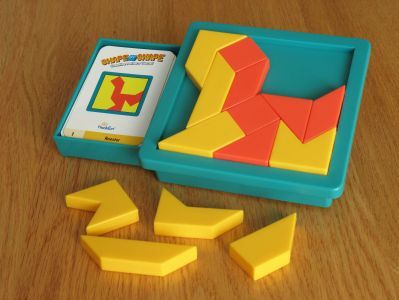 Game Essentials: In this variation on the traditional tangram puzzle, 14 puzzle pieces must be arranged in a square tray to match the pattern on one of 60 challenge cards. Six orange pieces form the foreground image, and eight yellow pieces form the background. The orange pieces consist of identical pairs of each of the following: square, parallelogram, and isosceles right triangle. The yellow pieces consist of identical pairs of each of the following: right trapezoid, isosceles trapezoid, swallowtail flag, and a five-sided polygon that resembles a boot. To solve a puzzle, a player must place all 14 pieces neatly inside the puzzle tray with no leftovers and no pieces sticking up. Anyone can try to solve the puzzles by placing the pieces in a haphazard way without much thoughtful planning. In our observations this usually results in more frustration than solutions, and that’s no fun. The real visual-spatial brain exercise and enjoyment comes when you take the necessary time to really think about where each puzzle piece should go. And it’s these mental gymnastics that can improve a person’s ability to handle visually intensive tasks from planning the seating at a wedding reception to designing pharmaceutical drugs to guiding a space-walking astronaut through a complex and unexpected situation from down here on Earth. While the Shape By Shape challenges are not ranked by level of difficulty, some are definitely easy and others much harder. Take a look at the dog and cat patterns below, and you’ll see what we mean. The Sad Dog in Challenge 12 is symmetric about the diagonal from top to bottom. Though not always the case, challenges with symmetric images often have solutions that require symmetric placement of the puzzle pieces. Furthermore, the pieces in the dog pattern do not share many edges, so it’s easier to recognize the shapes of individual pieces because they are not part of a larger area made up of connected pieces. For example, the eyes of the dog are obviously the two parallelograms while the nose is clearly one of the triangles. The two yellow areas that are shaped like the swallowtail flags pieces can only be made by those two pieces. Going outward from the eyes to the left and right corners, the yellow areas are most certainly the two “boots”. Once these obvious pieces are put in place, the placement of the other pieces becomes trivial. By contrast, the Sleeping Kitty in Challenge 14 is asymmetric in every direction, and the pieces in the orange area share a lot of common edges that are in the interior of the cat shape. In kid-speak, the orange pieces are in one big blob. A more mathematical way of putting it would be that the ratio of the area of the cat to its perimeter is relatively high. The same observations can be made about the yellow area. Generally speaking, the higher this area-to-perimeter ratio, the harder the challenge because your visual-spatial brain function has to sort through more combinations of pieces in order to replicate the pattern. Recommended Age: The manufacturer suggests ages 8 and up, but we think this is an ideal puzzle for much younger kids. Children who are not ready for the puzzle’s pre-defined parameters still stand to gain from the exploratory learning that just naturally happens through play. As a recent academic study indicated, Euclidean geometry is so intuitive that tribal children with no formal education in the subject understand its basic principles. Brain Play-To-Price Ratio: Shape By Shape lists for $14.99 but can be found at a slight discount. Even at full price, we think this game is a great value. As with all the ThinkFun games we’ve played, Shape By Shape is made with high-quality plastic that’s built to last. The puzzles and the number of puzzle pieces are at just the right level to be challenging but not frustrating for players of all ages and abilities. Sixty puzzles will keep you busy for while, especially if you commit to not looking at the hints on the back of the challenge cards, and you can enjoy the same puzzles again after taking a break. But one of the many cool things about Shape By Shape is that you can challenge yourself to discover new patterns not included with the game. Freestyle play is the one time when starting off with totally random placement is justified. Just go with it and see where it takes you. If you manage to fit all the pieces in the tray, check your pattern against the challenge cards and see if you’ve found a new one. If you’re really ambitious, try articulating the mathematical limits of the shape combinations that would fit in the tray. Multipurpose: Shape By Shape is another game that is perfect for exploring geometry. Try explaining geometric concepts when discussing observations like the following: The perimeters of the parallelogram and isosceles right triangle are equal, and the perimeters of the isosceles trapezoid, swallowtail flag, and “boot” are equal. The side of the square is equal in length to the shorter diagonal of the parallelogram. It’s also equal to the line segment perpendicular to the triangle’s hypotenuse that connects the right angle vertex and the hypotenuse. Which angles are acute, and which are obtuse? The orange pieces are of equal area, and the yellow pieces are of equal area that is 50% greater than the area of each orange piece. (Can you prove these statements about area rigorously? If not, at least convince yourself visually.) We could go on and on, but you get the point. Easier Adaptation: A two-part solution is given on the back of each challenge card. If you are working with a younger player, use the first hint to place some or all of the orange pieces. Then go back to placing the yellow pieces without help from the second hint. Unless, of course, you both get stuck and need the second hint. But don’t give up too soon! 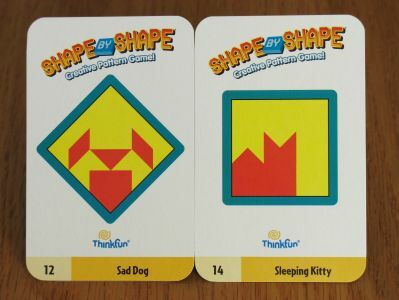 Noteworthy: Shape By Shape is one of six ThinkFun games invented by master puzzle designer Nob Yoshigahara. 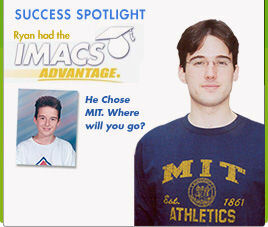 You can read about his work on ThinkFun games here. Note that the first contestant introduced during the in-studio competition, Holden Thorp, is now the chancellor at UNC Chapel Hill after having earned his PhD in chemistry from Caltech and going on to receive the NSF’s Presidential Young Investigator Award among his many accomplishments. Robots also enjoy the challenge of the Rubik’s Cube, or at least their human engineers do. You can watch and read about the robot that currently holds the speed record here. In our opinion, this little gem should be part of every child’s collection, although you should keep it away from little ones due to the small mechanical parts that can be removed. 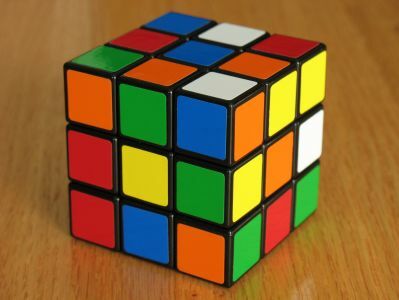 The original 3×3 Rubik’s Cube lists for $11.99 but can often be found for $8 or less. That’s dirt cheap these days for a cool thinking toy that’s also part of history. But if you’re just not into playing games in the physical world anymore, you can still test your Rubik’s solving skills here. If you missed Part One on logic games, read it here. See you next week for Part Three on strategy games! 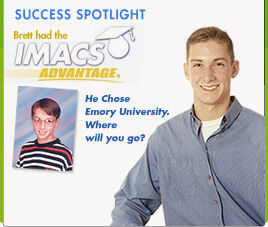 Visualize your future with IMACS. 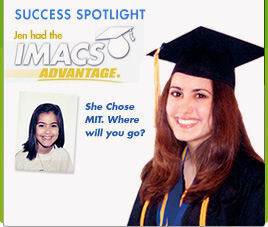 Take our free aptitude test. 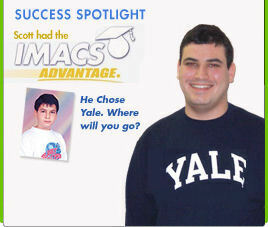 Follow IMACS on Facebook. Anti-Spam Quiz: three times 2 = ?